Unlike all other routes on Kilimanjaro, you sleep overnight in dormitory style huts at camps on Kilimanjaro along Marangu route. There are 60 bunk beds at Mandara and also at Kibo Huts, and 120 bunk beds at Horombo Hut. Although you have a bed and mattress, you will need to bring a sleeping bag. The huts have communal dining rooms and basic bathroom facilities, ranging from flushing toilets and running water at the lower huts to long drop toilets and bucket water at Kibo Hut. The route approaches Kilimanjaro from the eastern side through the thick Marangu Forest after a quick 30 minute drive from. Because the climb involves the same ascent and descent paths, scenic variations are restricted. It is also a more direct approach and for this reason an extra day acclimatisation is advised. Marangu climb can be done in as little as five days but this yields lower success rates. Descent is made via the same route. How long does it take to climb Mount Kilimanjaro on the Marangu Route? Marangu is one of the shortest treks on Kilimanjaro and can be done over as little as 5 days. This means that greater distances are trekked each day than you would do on the other routes. The overall success rate on Marangu is lower than the others because you have less time to acclimitise. Therefore is the best done over 6 days to add on one acclimatisation day and increase your changes of success. When is the best time to trek along the Marangu? Is Marangu different to the other routes? Marangu makes use of huts and is a shorter trek than the other routes. It is also therefore cheaper than the other routes which makes it busier. There are 60 bunk beds each at Mandara and Kibo Huts, and 120 bunk beds at Horombo Hut. The 5 day version has no chances of acclimatisation so it is better to do it over 6 days. Do we stay in tents or huts on Marangu? Marangu is the only route where you are accommodated in bunk houses or huts. How would you grade the trek along Marangu for difficulty? Our grade: Trek Grade: 2c (FP) along the Coca Cola or Marangu. It is often ranked as easier than the others but acclimatisation chances or less. We leave Moshi town at about 0900hrs for Marangu Gate and start hiking between about 10h30 and 12h00. The route takes one through a thick rainforest from the park gate to Mandara Hut. Dinner is served during the early evening in communal dining areas. This morning we start out towards Horombo Huts on a route that will take about 5-6 hours. The climb will take us through the heath zone with small shrubs being the main vegetation. At our lunch stop about half way up, we will get stunning views across to Mawenzi. We will arrive at Horombo Hut around 15h00 with Kibo crater summit already in view. Wake to breakfast as usual. Pack and begin the hike to Kibo Huts. The first half of the day&apos;s hike traverses the upper heath zone while the second half crosses the vast saddle that connects Mawenzi and Kibo. The saddle is an alpine desert that resembles a lunar landscape. It is here that you may begin to feel the first effects of altitude with shortness of breath and irritability, assuming it had not taken effect earlier. The day&apos;s hike should take 6 to 7 hours, stopping half way for lunch. Wake around midnight and prepare for the summit ascent. This part of the hike is carried out during the early morning before dawn so that the climbers reach Kilimanjaro Uhuru Peak at around sunrise. Leave at about 1:00am and reach Gilman&apos;s Point at about 7:00am. The climbers are met with views of the crater from Gilman&apos;s Point. Another 2 hours of hiking will bring you to Uhuru Peak (19,340 ft) at about 8:30 am. From there you descend back to Kibo Hut, collect your possessions and cross the saddle again at Horombo Huts where you spend the night. Habitat: Rain Forest Wake as usual, pack and then descend along the same route to Mandara Huts for lunch, before hiking down Marangu park gate where you will be met by your transport back to Moshi. You should reach the park gate around 14h00. Those climbers who climbed to Gilmans Point (5700m) are issued with green certificates and those who reached Uhuru Peak (5895m) receive gold certificates for your Marangu Route climb on Kilimanjaro. After breakfast, transfer to Kilimanjaro International Airport for you flight home. When is the best time to climb Mount Kilimanjaro? Which route should I choose? How do I dress for the cold? What hiking boots should I buy? How can I train for altitude? How will the altitude affect me on Kilimanjaro? Is Kilimanjaro a technical climb? How long does it take to climb Mount Kilimanjaro? 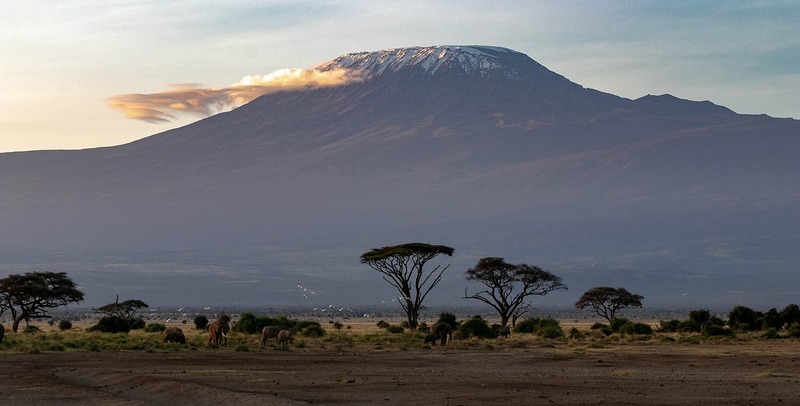 How fit do I need to be to Climb Kilimanjaro? Do I need to undergo specific medical tests? What gear do I need on Kilimanjaro? Should I climb Kilimanjaro during a full moon? What if I have to turn back? Books and other resources?